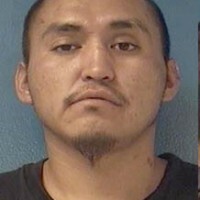 What was initially reported as a domestic violence situation in east Gallup turned into an aggravated battery on a peace officer charge for a Gallup man, according to a Sept. 8 police report. McKinley County Sheriff’s Office Deputy Lorenzo A. Guerrero was advised of a vehicle with a possibly drunk driver at T&R Market at 667 N. Hwy. 491 in Yatahay. Guerrero was informed the vehicle was in the parking lot and security was on hand. On arrival, Guerrero met with a security guard who said the vehicle had been parked at a pump when he first made contact with the driver, who was slumped inside. There was an open container of beer in the car. The driver drove to the parking lot. According to records at the McKinley County Adult Detention Center, two suspects who carjacked a female in the parking lot of the Walmart Supercenter at 1656 W. Maloney Ave. on Sept. 7 remained in jail Sept. 15, each on a $50,000 cash-only bond. Patterson Cleveland, 23, and Philbert Smith, 27, were arrested on aggravated battery and robbery charges. According to a police report, Gallup Police Department Officer Jeremy Shirley, responded to a call at about 6:50 pm on Sept. 7 in regards to a female who was assaulted and dragged from a maroon 2007 Ford F-150 pickup truck by two males. Several dozen area people gathered at the McKinley County Courthouse the morning of Sept. 11 to honor those who lost their lives 15 years ago during the terrorist events of Sept. 11, 2001. The free event was put on by the city of Gallup and attended by folks from around greater McKinley County. Mayor Jackie McKinney delivered a short address and said police officers and first responders work daily under sometimes trying conditions to help ensure the safety of people under their watch. He said the sacrifices made by first responders that day in 2001 must never be forgotten. “These are remarkable people,” McKinney said. *Final census numbers and reporting will be pending.